For automotive emission testing in the UK and beyond, Premier Diagnostics relies on our own Model #303/303 check valves as a critical component to control the flow of exhaust gasses and condensation in their Elite Micro Gas Analyser. In order to meet strict quality standards and compliance, the Model #303/303 check valves ensure an airtight gas handling system to avoid any possible air dilution of sampled exhaust gasses beyond maximum permissible errors, as well as the flow control of calibration gas and condensation. Additionally, the valves are critical to the performance of the mandatory leak test, which is performed daily to ensure the integrity of the gas handling system. If the exhaust gas analyzer detects air dilution that exceeds permissible values, the leak test will be unsuccessful and no measurement can take place until the cause of the leak is identified and eliminated. A total of three Smart Products check valves are fitted to Premier’s gas handling system to ensure optimal performance. Barbed at 3/16" (4.76mm), the custom-built Model #303/303s were carefully selected to meet a strict performance criteria specified to work well with temperature range, gas mix, possible impurities, as well as durability and reliability requirements. PC-based with lambda calculation, this four-gas analyzer is designed for market-specific regulated emission testing, which includes the annual Ministry of Transport (MOT) test in the UK. 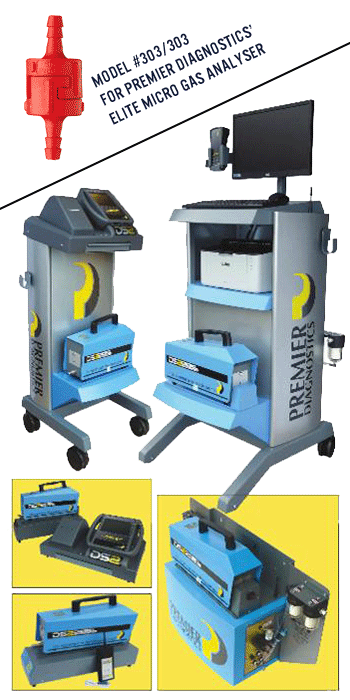 The Elite Micro Gas Analyser is included in all Premier Diagnostics' combination product builds such as the Premier Combi and Premier Compact for petrol and diesel emission testing (all pictured). This test equipment is typically used by companies and agencies authorized to perform Periodic Technical Inspections (PTI) on vehicles as part of mandated government road worthiness checks that include exhaust emissions. The equipment can also be used by vehicle service and repair shops for emission diagnostics to ensure optimal engine performance and to check the workings of emission reducing technology.